The Teenage Mutant Ninja Turtles reboot will begin production before the end of the year, assuming everything goes according to plan. This comes from producers Andrew From and Brad Fuller, who are producing the project for Paramount Pictures, via Platinum Dunes, which is Michael Bay's production company that was also involved in the most recent iteration of the franchise. With any luck, we'll be getting another new take on the heroes in a half shell sooner rather than later. This was revealed by producers Andrew From and Brad Fuller during an interview at the Critics Choice Awards. The producing duo was there on behalf of A Quiet Place, which was a huge hit at the box office and has been getting some love during the awards season circuit so far. During the interview, they revealed that not only is the reboot definitely happening, but that the hope is to begin filming sometime in 2019. Here's what Form had to say about it. "That is looking like production by the end of the year... We don't have a director yet, but we have dates we're trying to hit. That's all." On the flipside, Brad Fuller seemed a bit surprised that his producing partner was so forthcoming with this information, as Paramount has yet to announce anything officially. In any case, this project is happening and the TMNT will be back in action. Beyond knowing that it's happening, details on the reboot are tragically scarce. As Form mentions, they don't even have a director hired yet, nor do we know who is penning the screenplay. Despite that, they seem quite optimistic that the movie can get off the ground before the year is up. The Teenage Mutant Ninja Turtles started as a comic book created by Kevin Eastman that was initially released in 1984 and was intended as a parody of sorts for Marvel's Daredevil. The book took on a life of its own and the brand really caught fire once the 1990 live-action movie hit theaters, which spawned two sequels. There have also been many different animated shows over the years and various iterations within the comics as well. 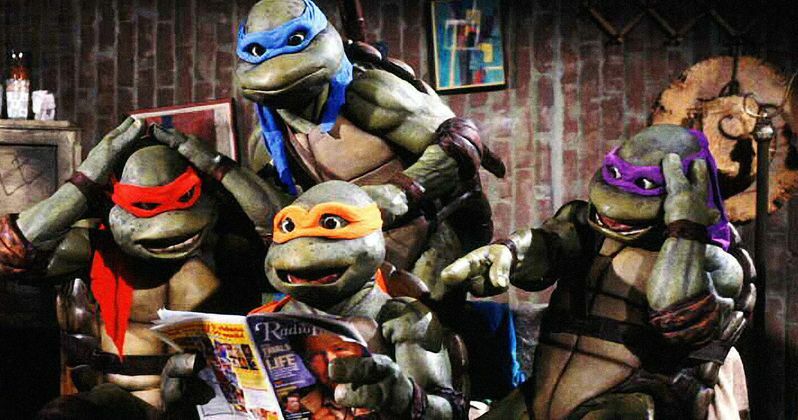 The brand has evolved a lot over the last 30 plus years, but Donatello, Michelangelo, Raphael and Leonardo have remained a staple within the pop culture landscape. The most recent live-action version of the franchise came our way in 2014 with the Jonathan Liebesman-directed Teenage Mutant Ninja Turtles. The movie was a reasonably big hit, grossing $493 million worldwide. The follow-up, however, 2016's Out of the Shadows, was not nearly as successful, bringing in just $245 million. That's what prompted this latest reboot, as Paramount clearly still sees value in the brand, but knew they needed to move on from what they had been doing. We'll be sure to keep you posted as any further details on the project are made available. Feel free to check out the interview clip from the Variety Twitter account below.